Consider this scenario. You run a Japanese restaurant. It is located in an awkward location on the outside of a plaza in Richmond (where there is only parking on the inside of the building). You decide to only open 5 days a week. Furthermore, you decide on serving dinner from 6:00pm to 9:00pm. 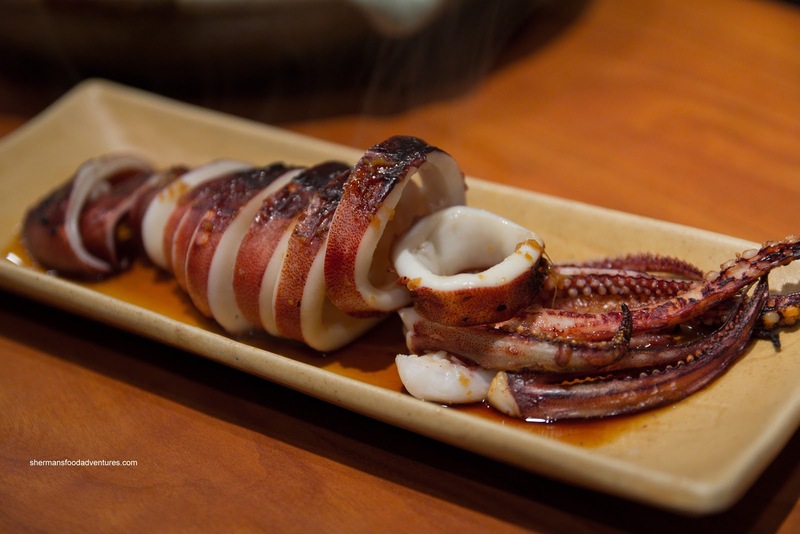 The menu will be simple with no specialty rolls and barely any cooked food. The entire staff will consist of husband and wife only too. Oh and you figure that premium pricing must be charged too. Sounds like shaky business principles right? On the contrary, that is definitely not the case. 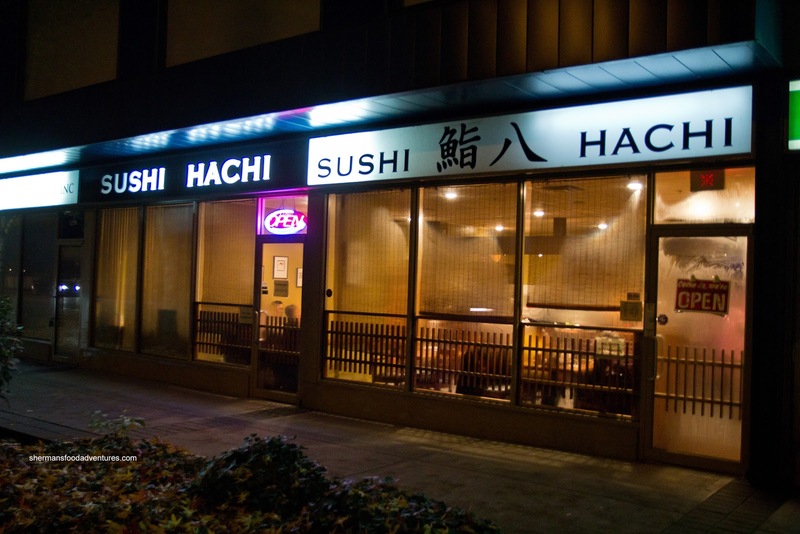 Welcome to Sushi Hachi, an authentic Japanese sushi bar that survives despite the aforementioned challenges (although I've heard that the owner doesn't need to operate it for anymore hours). Due to the limited hours, I have found it a challenge to eat there. Finally, I just had to make time and I enlisted the help of Whipping Girl as an eating partner. We started with the Ankimo (monkfish liver) which was accompanied by the usual green onions, daikon and ponzu dressing. 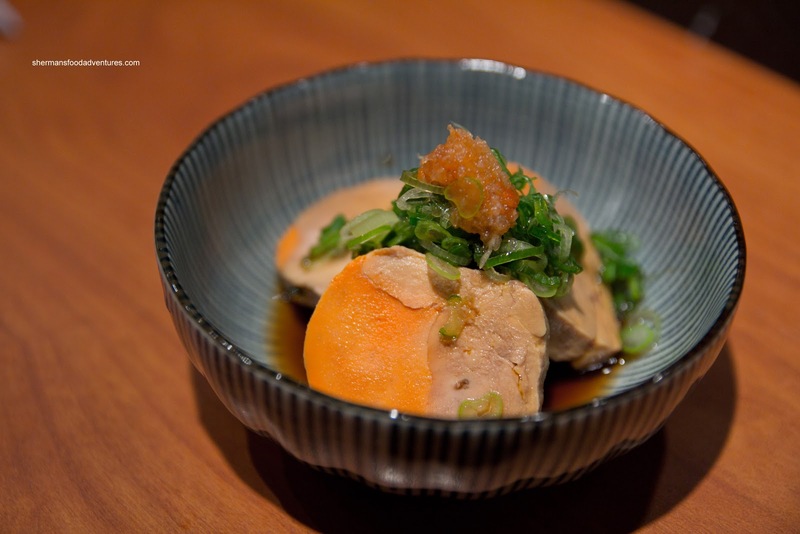 We found the liver to be smooth and definitely lived up to being the "foie of the sea" where we did taste the ocean (in a good way). Next up was the Grilled Squid which was only so-so. It wasn't as grilled as we would've liked as it was chewy and had a "steamed" quality to it. 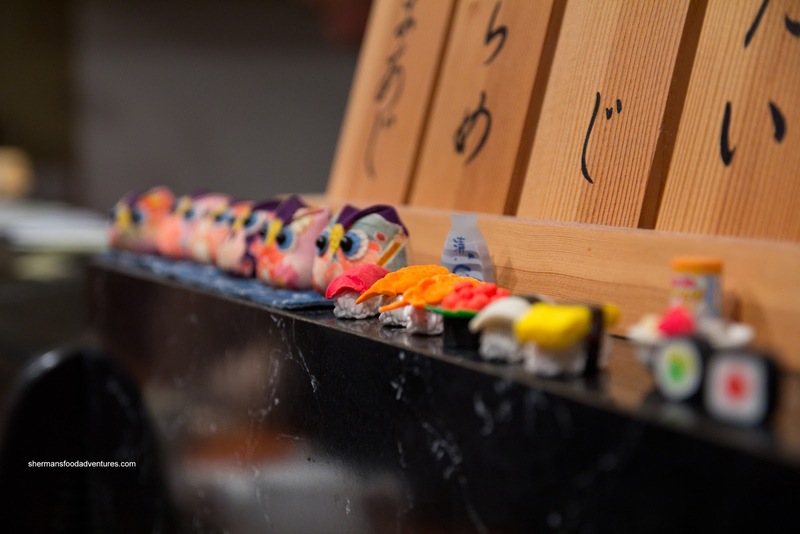 But honestly, we weren't here for the squid, it's all about the sushi. As such, we got the Chef's Choice Sashimi which was definitely more about quality than quantity. 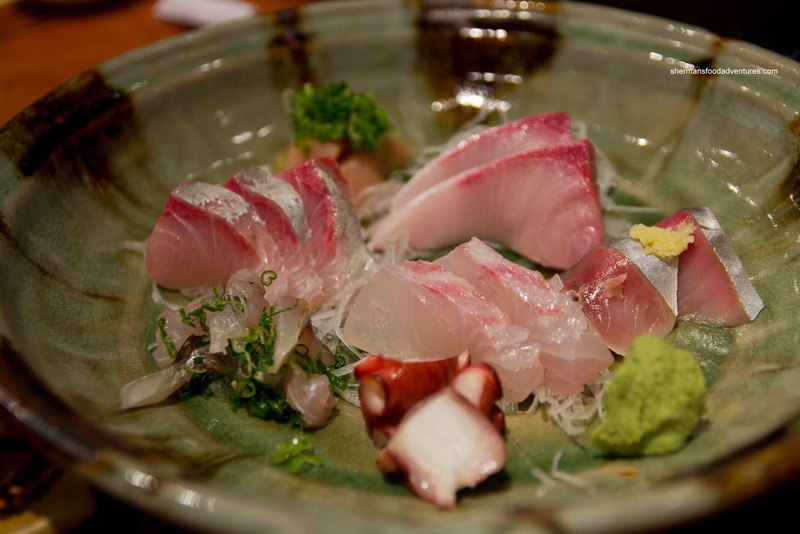 On the plate (starting from the front middle and clockwise) was Tako, Aji, Kampachi, Hamachi, Skipjack Tuna and Flounder. The beautiful sheen only accentuated the lovely sweet flavours of the fish (where we could taste the fishiness, in an appetizing way). The textures were on point and although it set us back a hefty $25.00, it was worth every penny. 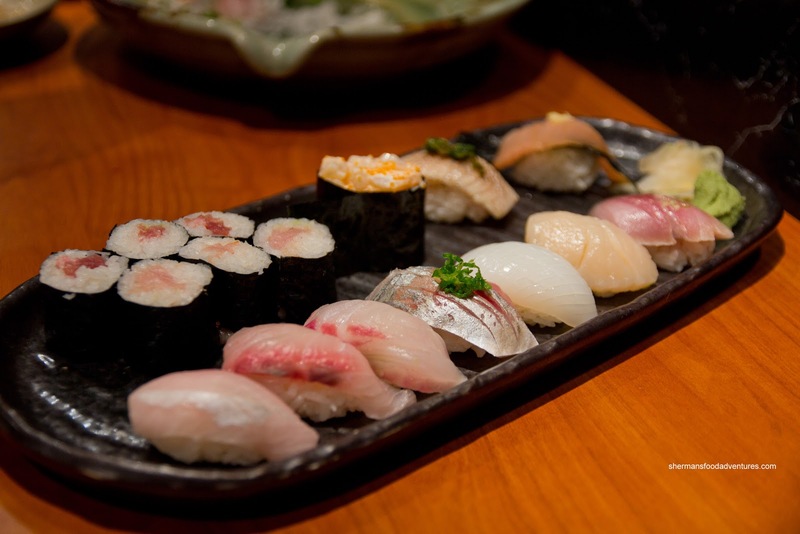 Seeing how we had the Chef's choice of sashimi, we went for the Chef's Choice Sushi as well. It included (starting from the front and counterclockwise) flounder, hamachi, amberjack, skipjack, ika, hotate, bonito, tuna, seared black cod, chopped scallop and 2 types of tekka maki. Once again, the fish was fantastic while the sushi rice was on point - it was chewy with the right balance of vinegar and sugar. The rice-to-fish ratio was also good. At the end of the meal, we were impressed and thought it was well-worth the price. 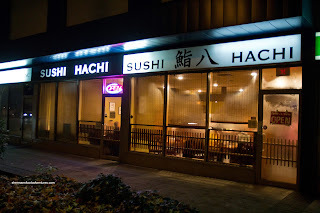 One word of caution though, if one was looking for fancy fusion rolls and large portions sizes, it would be best they move along because Sushi Hachi is about the simplicity of sushi - fresh and well-made.